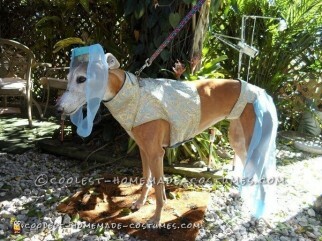 This I Dream of Jeannie costume was made for my female Greyhound Queen. I found some beautiful tapestry and sheer remnants and got to work. I made the hat with cardstock, covered it with fabric and attached an elastic chin strap. I created the pattern for the body parts and put the top and bottom together. Sure, it was time consuming, and Queen was less than cooperative with the fittings, always trying to lay down when she was being measured. The hardest part was fitting for the back leggings. She’s not much for this process, but she sure loves to wear the completed outfit and she does so with pride. Queen looked so great in this costume that I decided to enter her in the local Pet Supermarket Halloween Costume Contest. There were many entries, but mostly store-bought costumes. All the dogs lined up, waiting for their turn to show off in front of the judges. Queen was getting a head start prior to the competition, prancing through the store, showing off how good she looked. The other dogs and owners gave us dirty looks. Then, it was her turn to strut her stuff in front of the judges and strut she did. It was if she knew that she had to impress them. As I walked along with her, I saw that look of confidence in her eyes, as if she were saying, “Look at me, I am beautiful in this costume and I deserve to win”. When we walked by the judges, who were sitting on the floor, she went over to greet them and gave kisses all around. She was the only dog who did this I may add. After a brief interlude, the judges returned with the results. As they were about to announce first place, the judges looked over at us and smiled, and then I heard Queen’s name. She had won. In addition to her winning this contest, I received many compliments on this costume. This prompted me to start making other costumes and outfits for Greys and my Queen is the top model.